Dubai, UAE, January 27, 2019: With over a century of jewelry excellence and mastery, Mouawad rings are handcrafted by skilled artisans with utmost meticulousness. Every ring tells a story of love, romance and magic, capturing a unique charm in natures’ most beautiful creations. The artistic journey begins when masterful design gives way to intricate craftsmanship, culminating in a unique artistic statement. From vivid rocks to fancy shapes and colors, Mouawad’s collection of glowing diamonds sparkle with a shimmering elegance that only few can call their own. The collection includes exceptional creations from Diamond Classics, all with precious gemstones adorned in 18K white or yellow gold settings. The House of Mouawad has always been firmly committed to the authentic traditions of jewelry making, purveying exceptional jewels and rare diamonds. 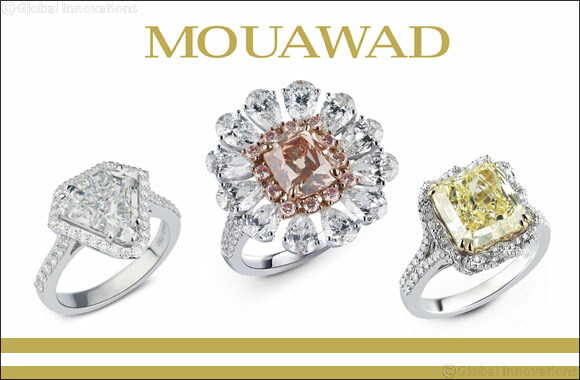 Every piece created by Mouawad is destined to associate the beholder with a bond of admiration and passion. Mouawad pieces are worn by royalty, celebrities and collectors, and are coveted by all for their masterful design, superb quality and breathtaking refinement. Today, Mouawad is a globally reputed brand and luxury jewelry that continues to set the trends and capture the hearts of generations, with styles, hues and designs that become a treasured part of life’s most precious moments.